A quick tool to compare database test result and perfect algorithm. Standard Coverage : IEC 60601-2-47, ANSI/AAMI EC57, YY 0885. AI sync function unifies original TAF into comparable TAF. 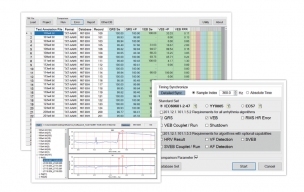 Discrepancy data and discrepancy timing can be displayed for advanced algorithm improvement. Comparison result is identical with PhysioNet WFDB library software and can be exported to a report file.